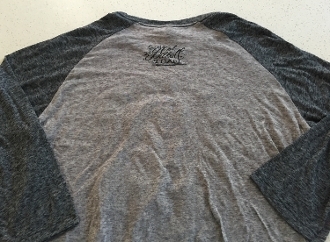 TRUE FIT TATTOO LIMITED COLLECTION: Unisex microburn raglan tee by District. 3/4 Length contrast sleeves in tonal gray. Relaxed modern fit... super soft! SCPT tattoo-inspired custom design by Tomas Archuleta on the front and small SoCal Pitbull TEAM imprint on back. 75% Polyester/25% Cotton. Machine washable. Contact Us to Inquire about backordering out-of-stock items. Copyright © 2015-2019 SoCal Pit Bull TEAM. All rights reserved.